Regain your beautiful smile, and your confidence, with full or partial dentures from Fischer Family Dentistry. Losing teeth can be traumatic. Our expert doctors will restore the appearance and function of your missing teeth. We’re on the cutting edge of Denture technology. Not only will dentures give you a completely natural look, they’ll also provide support for your facial muscles. This means you’ll be able to eat normally, and speak clearly again. If you’re in need of dentures, we invite you to come in for a free consultation. We’ll assess your needs and find the best solution. Dentures can be placed in tandem with dental implants, or as a stand-alone solution. 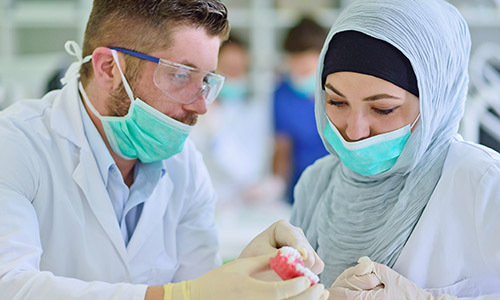 Our doctors have over thirty years of experience in tooth restoration and repair. Complete dentures can replace all of your teeth, or a single arch. Gone are the days of oversized dentures that fall out of your mouth. Don’t believe what you’ve seen in TV and movies. 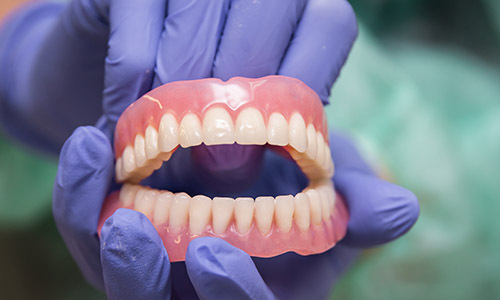 Modern dentures, using new technology, are secure, and natural looking. Your speech will be as normal, and so will your ability to eat and drink comfortably. This is a cost-effective solution for people suffering with aging teeth, or advanced gum disease. A partial denture is a removable appliance. It’s supported by your existing teeth. Like full dentures, partials will help you regain your ability to eat and speak normally. We’ll assess the health of your remaining teeth to make sure that partials are the right choice for you. If you have older dentures, or your dentures have undergone wear and tear, we can repair them at an affordable cost. The process is quick, and painless. Even if they were created by a different dentist, we’ll be able to fix them so that they’re as good as new. Don’t wait any longer to regain your confidence, and your natural appearance.